Sea Breeze on Belt is a clean, light and bright townhouse for those looking for comfortable quality accommodation, in a prime location, on a budget. This lovely two bedroom townhouse offers spacious open plan living with a conservatory to relax in the sun and enjoy a good book or a morning cuppa. Slide back the large sliders and enjoy the fantastic indoor outdoor flow and all day sun. You won't mind cooking here as you have a fully equipped kitchen with a fantastic bi-fold window where you can soak up the ocean views. In the evening cook up a storm and pass the food directly out the window to enjoy alfresco dinning in the garden while listening to the waves rolling in and discussing your days adventures. Added features include, quality bathroom with a bath, coffee machine and WIFI. This townhouse has great off street parking where you can park you car right outside. You properly won't use it here as most of New Plymouth's major attractions are in walking distance. All Bach Break properties come well equipped with cooking oil, salt, pepper, coffee, tea, sugar, milk, cleaning products, dishwasher tabs, dishwashing liquid, toilet paper, liquid soap and body wash.
You can't beat this for value for money, location and comfort. Book today. Very spacious and tidy property with all the necessary amenities. A stones throw to the coastal walkway and walking distance to the CBD. A very pleasant place to stay. 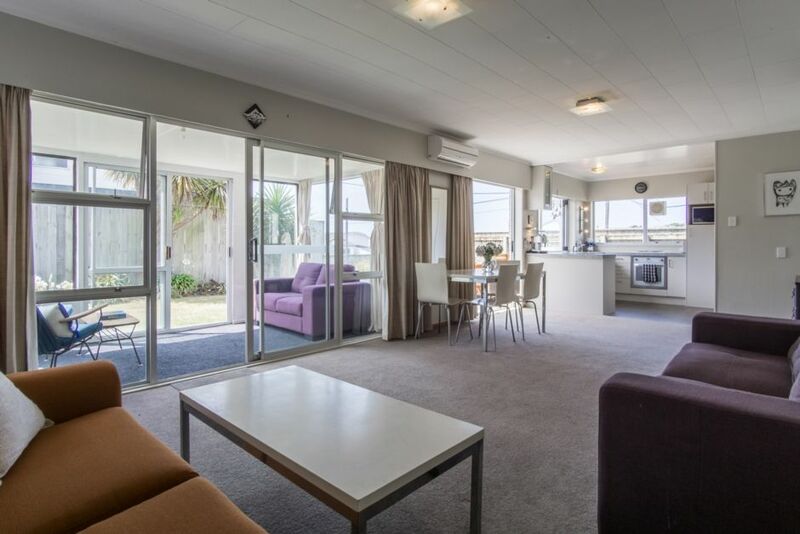 Thoughtfully and well equipped, very clean and tidy, 1.5 km from town, and right on the coastal pathway. Comfy beds, and easily spacious enough for a small family. We chose this over a Fitzroy property in order to gain peace and quiet, avoiding the party scene, and we were not disappointed. We would certainly return to this property. We enjoyed our stay in this spacious clean and tidy unit. Great kitchen, super comfortable beds and good location. No traffic noise to speak of as it is at the end of the road, although the train track is nearby but only heard it around 7am on a weekday. Car park is fairly tight but you could easily park on the road if you wanted to. A dvd player would be a welcome bonus. Lovely sunny, warm property. Spacious and very clean.